Ryde Library, located within Top Ryde City is one of my favourite libraries because of its layout, its facilities and its friendly staff. These facilities include a games library, disabled toilet facilities, baby change rooms, wheelchair access and more. 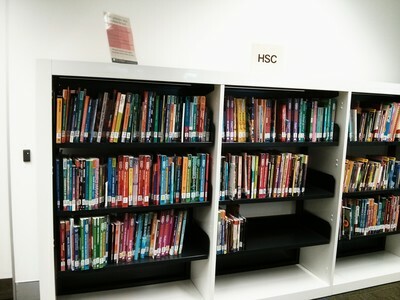 The book collection in this library is extensive enough for most purposes, though not as large as collections in other libraries like the one in Parramatta. However, new novels are always being added, and there is certainly enough to keep visitors entertained. 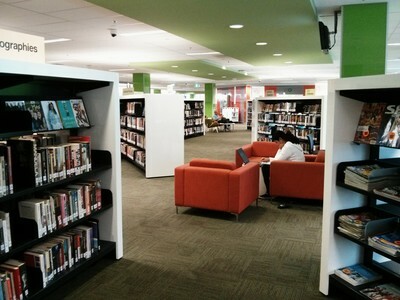 If you are in the mood for reading, Top Ryde library is one of the most comfortable and spacious places at which you can do so. I particularly love the travel section in Ryde Library, as there is a large variety of travel books to be found there. Also to be found in this library is a CD and DVD section. Loans for these items are usually limited to a week, though renewals can be done online. 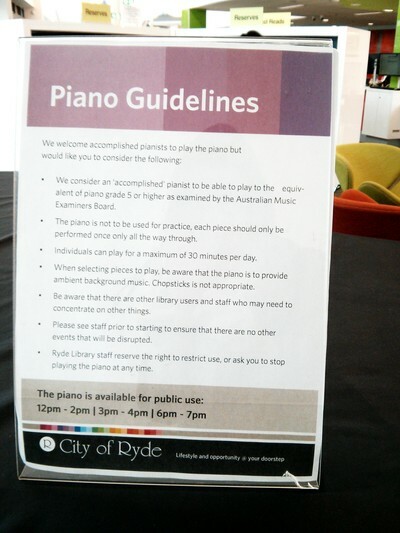 Other interesting facilities at this library include a beautiful grand piano which can be played between certain times by accomplished pianists. Though I have visited this library many times, I have rarely heard the instrument being played, and so I encourage talented musicians to come and try it out. 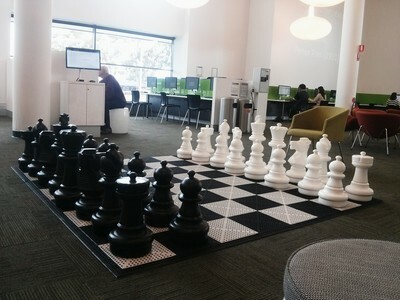 Also worthy of note is the giant chessboard found near the computer terminals at Ryde Library. It is quite a novelty attraction, and children in particular love pushing the pieces around. The children's corner in Ryde Library contains a variety of picture books, children's literature and children's DVDs. The section is often visited by curious children who can then pick out different books to read or even to borrow and take home. A variety of activity sessions are also run at Ryde Library, with segments aimed at 0-2 year olds, 2-5 year olds, and primary aged children. Visit the official website page below for more information. Occasionally, activities for adults are also run at this library. Talks by authors, inexpensive or free workshops and more can be run. Keep an eye on the What's On page for more information. Lastly, I would describe Ryde Library as an excellent study space. With free WiFi, power points for laptop chargers, study tables, booths and a collection of HSC workbooks; in the afternoon this library will often be filled with studious workers studying for school, exams or university assessments. The space is quiet. 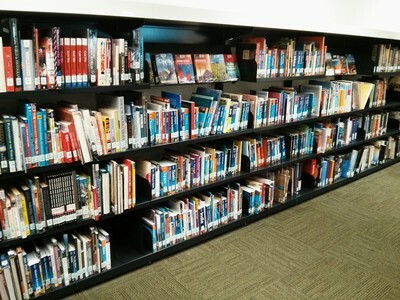 The library has a wonderful layout, and the facilities are excellent. For group work, small rooms can also be booked. 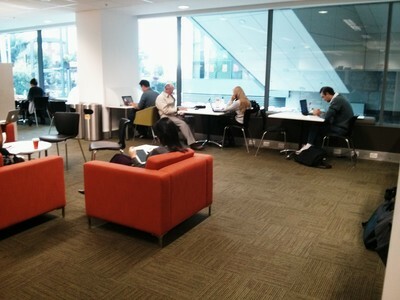 The study section in this library is quiet and tidy with a range of excellent facilities; most notably, free WiFi. Ryde Library is therefore well worth a visit if you are studying, looking for a quiet browse or read, hoping to include your child in some fun activities, or looking for some DVDs to borrow for a week. 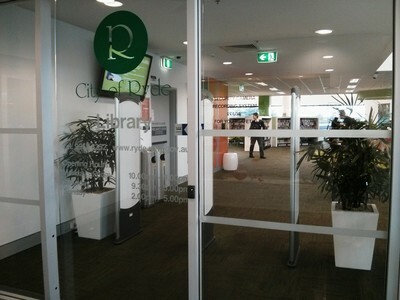 Being so close to Top Ryde City Shopping Centre, this library is a convenient place to visit after or before shopping. Note however that public transport to this area is not always convenient, with no train system in place. Many buses provide transport to and from this area, but it is most easily accessed by car. 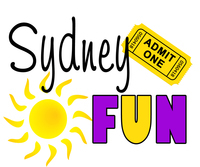 Where: 1 Pope Street, Ryde NSW 2112 (cnr Pope and Devlin Streets, within Top Ryde City Shopping Centre). 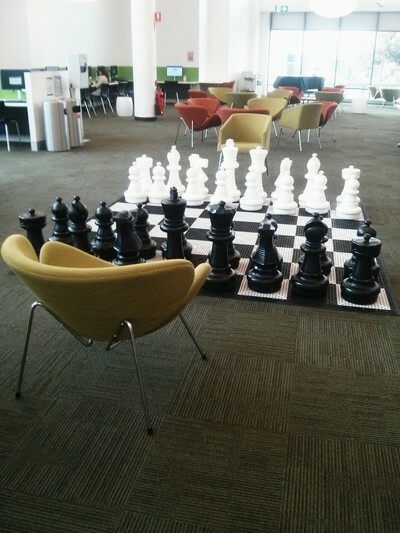 Why: For access to a variety of books and films; a quiet, tidy study space; a game of chess with giant chess pieces, and/or for playing the grand piano. Good for kids: Yes. 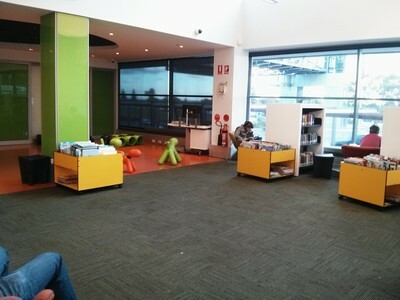 There is a spacious children's corner with a variety of picture books, small seats, and other children's literature and films. A variety of children's activities are also run at certain times in Ryde Library. See the official website for more information.